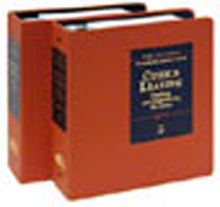 Each year my colleagues and I are asked to update the Continuing Education of the Bar’s (CEB) publications – Office Leasing: Drafting and Negotiating the Lease – and Retail Leasing: Drafting and Negotiating the Lease. It can be a lot of work (particularly since the deadlines always seem to fall when I’m working on a big project) so it’s nice when you get to see the final product in print. The update to Office Leasing was released in October and the update to Retail Leasing was released in November. As in prior years, I served as update author for the construction-related chapters of Office Leasing (Chapters 19 and 40) and Retail Leasing (Chapters 21 and 39). Now I just need to get a pipe and an ascot.